Right now I am up late waiting for a ebay listing to end. The listing is for the dress that Amelia will wear for Michael and Kristin's wedding next month. 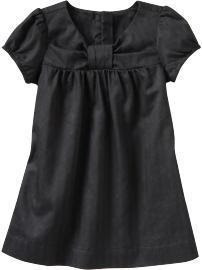 The girls will be wearing matching dresses, but Amelia's size was sold out on gap.com, so I'm having to stay up until this auction ends at 1:17am. What is that about? I have about 40 minutes left. Speaking of dresses, I finally found a dress for Michael and Kristen's wedding. As a back story, after being a bridesmaid for Christan and Mary's wedding I swore up and down that it was the last time. Well shortly after Michael and Kristin got engaged, Mom, Catherine, Mary, Kristin, and I went out for a celebratory dinner. During dinner I let Kristen know that I appreciated if she considered asking me to be a bridesmaid, but I would politely decline the invitation. Kristin said she would like me in the wedding party and that the plan was for all the bridesmaids to wear black dress, and it could be any black dress. Well I reluctantly agreed thinking, "How hard will it be to find a black dress?" Well, its proven to be rather difficult. I didn't want to spend a ton of money, and the dress had to be able to have a teal sash worn with it. So like I said, I finally found a dress. I even got a great deal on the dress. I had high hopes. I purchased the dress on a Saturday night, and because I was going to be visiting my family in Raleigh (well, Fuquay) the following week I decided to have the dress shipped to their house. Well the week came and went and the dress was not delivered. Long story short, my sister came to visit me and brought the dress with her. I love the the dress, it seems really well made. I put it on and zipped it up and . . . no dice. The dress fit my perfectly everywhere, everywhere except, well if you know me you know where it didn't fit. I went online to look into exchanging the dress, thinking I could get a larger size and have it tailored down to fit. Well the next two dress sizes up are both on back order until December 25th. What?! I am so frustrated. So its back to square one with the wedding in three weeks. After some major stressing, visit a few local stores ('cause that is all there is around here), and spending a few hours online, I think I've found another dress that will work. I am praying it fits well, it is delivered quickly, and that I have enough time to get it tailored if needs be. I swear this is the last time. Never again. oh that makes me want to cuss- cuz I have the same PROBLEM and it makes me ANGRY!!!!!! All I have to say is chop chop when I get the money hehehehehe :) can't wait... did you win the auction? Elizabeth, Catherine and I were talking the other day, because we're really close, and we decided that you need to know that your future sister-in-law's name is spelled "Kristin," not "Kristen." So... maybe work on that before the wedding. P.S. This comment is a joke, except that Kristin's name really is spelled with two i's. P.P.S. You can totally slap me in the face the next time you see me to pay me back for how snotty this comment is. So did you win on ebay? I too have the same problem with dresses and button down shirts alike. I hope the new dress works out and that it looks good with a teal sash! Did she win the auction, of course! My wife is the master of winning ebay auctions!